Crisp, clean, all-white blooms 6-8 across on a background of lush green foliage are a refreshing sight during the long hot days of summer. It is a perfect perennial for a back-border planting. Ships in a 4 inch pot. 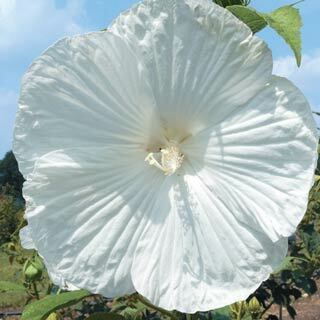 Botanical Name:	Hibiscus Snow White Delight Form:	Herbaceous perennial Sun Exposure:	Partial Shade/Full Sun Height/Habit:	3 - 4 Spread:	3 - 4 Spacing:	3 - 4 Hardiness Zone:	Zones 4 - 9 Foliage Type:	Medium green palmately lobed leaves. Flower Form:	Large, 6-8 diameter blooms that are open saucer-shaped with overlapping petals with crinkled edges. Flower Color:	Crisp white Flowering Date:	Mid summer until frost. Planting Requirements:	Full sun for best flowering. Soil Requirements:	Well drained, but moist soil. Growth Rate:	Fast once established. Unique Characteristics:	Lush green maple-like leaves set the stage for crisp, clean all white blooms. Refreshing color combination for the long hot days of summer. This hibiscus has a somewhat smaller stature than other perennial hibiscus varieties. It appears to have strong stems therefore avoiding the large blooms from flopping over. The perfect companion to a dark leaf hibiscus. Pruning:	None necessary. Additional Information:	Hibiscus are late to arrive in spring. Don't give up, they love to wait until the ground temperatures are nice and warm before appearing in late spring. They grow rapidly, making up for lost time quickly.